Heaney’s statement, about the act of writing, also resonates for me as a reader. We read to see ourselves – to illuminate our present and our past – to set the darkness echoing. In Edmonton we rarely, if ever, are given the opportunity to see ourselves and our city reflected in the pages of a book. 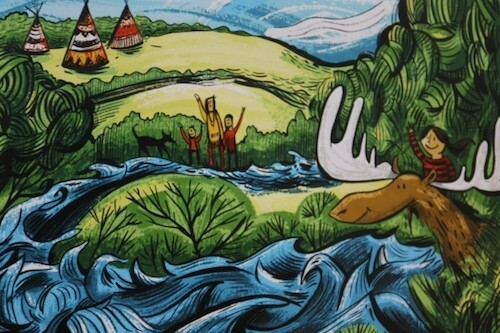 There have been strides in adult literature, but until the publication of Rutherford the Time-Travelling Moose, there have been no picture books celebrating Edmonton for children. 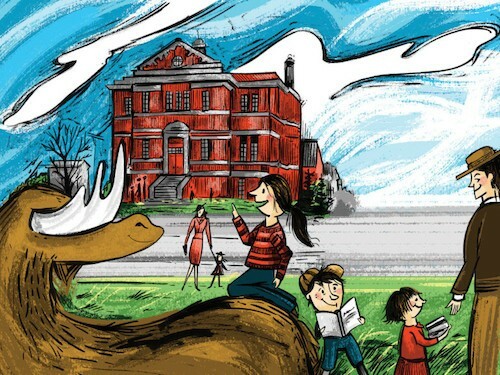 Rutherford the Time-Travelling Moose was initially conceived as a picture book about Edmonton’s history in the context of Rutherford House, the home of the first Premier of Alberta, Alexander Rutherford (1905-1910). 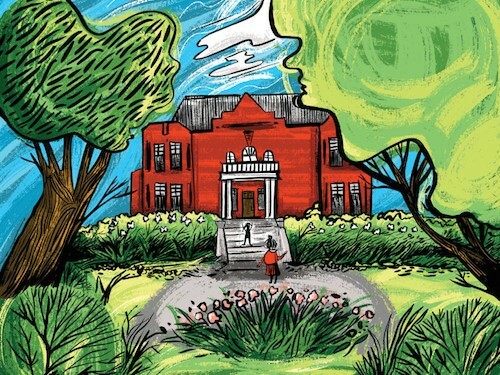 The Friends of Rutherford House Society issued a call for story proposals and Thomas Wharton, an award-winning local author, won the bid along with illustrator Amanda Schutz, also a resident of Edmonton. 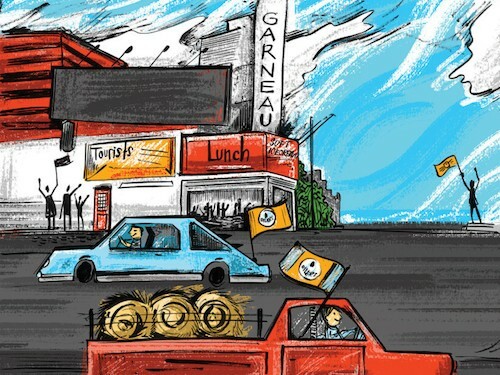 Wharton was commissioned to “animate” the bones of the story, taking it beyond its original confines to the places in Edmonton the premier and his family would have known. As luck would have it, Rutherford is a time-travelling moose. Astride his back, Rutherford spirits the adventurous girl back to the ice-age and then travels forward through various eras, including a visit to a First Nations settlement along the banks of the North Saskatchewan River, fur traders at Fort Edmonton, an early 20th century legislature (where the Famous Five can be spotted in the foreground), the High Level Bridge with a streetcar running along the top (as its facsimile does to this day) and other recognizable Edmonton landmarks and historical touch points. Unless you’re from a major city like New York or London, like me you probably get excited when you see familiar people and place names in books, simply because it doesn’t happen that often. 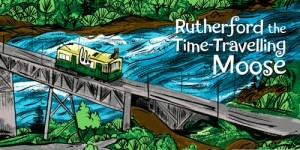 This alone makes Rutherford the Time-Travelling Moose essential reading for every child in Edmonton, but it’s particularly gratifying as an illustration junkie to see my city presented so beautifully. Schutz’s bold and colourful palette serve Edmonton well, and her humourous characterizations keep the mood light and fun. Indeed. 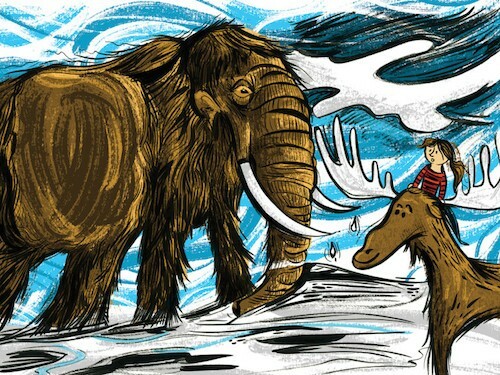 Rutherford the Time-Travelling Moose leaves the reader, young and old, hungry for more Edmonton(or moose)-based stories. 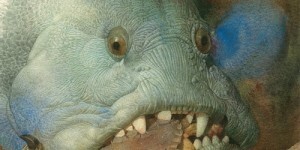 It’s time to set that darkness echoing. THOMAS WHARTON is the award-winning author of the young adult trilogy Perilous Realm and the Alberta-centric novel Icefields (a Canada Reads finalist). Wharton was born in Grande Prairie, Alberta and is currently an associate professor of writing and English at the University of Alberta in Edmonton. 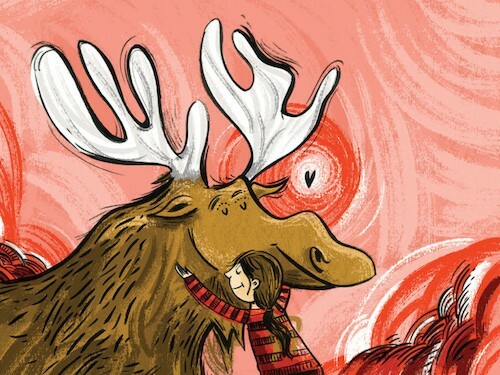 AMANDA SCHUTZ is an Edmonton-based illustrator and designer. Schutz is the creative director of the design firm Curio Studio and her work has appeared in many children’s books and publications. 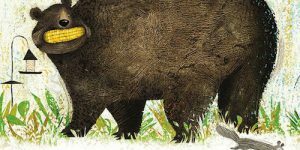 This Moose Belongs to Me by Oliver Jeffers is like the shreddie in a bag of Nuts ‘n Bolts: impossible to resist, and so spectacular in flavour it makes the pretzels and cheesy things pale in comparison. I know. Could this metaphor be more strained? 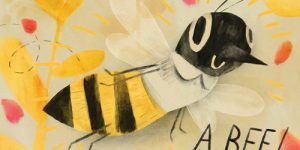 I will confess that I’m experiencing difficulty coming up with adjectives for the singular brilliance of artists like Oliver Jeffers, Jon Klassen, Lisbeth Zwerger, and the other illustrators who populate this blog (and elsewhere.) 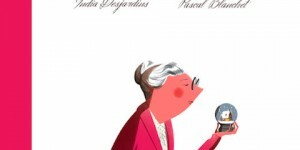 While these artists are few, they are without a doubt masters of their respective mediums, and at the core of what is arguably a highpoint in the history of illustration. 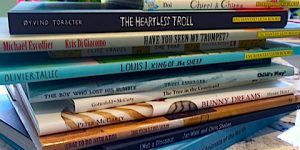 A low-point as well, as there are many more bad books than good, and e-readers threaten to erase or at least diminish the sensual and visual pleasure of a truly great picture book. At this moment, however, the privilege still exists, and I would strongly recommend that you get your hands on This Moose Belongs to Me.